I haven’t experimented that much with my ice cream maker but after making this I’m feeling inspired to use it more often. The clotted cream makes the ice cream even more creamy and rich if that’s possible. And it makes a nice contrast to a bit of spiky, sharp blackcurrant flavour – although you could add more sugar if you want to sweeten the blackcurrant more, or use another soft fruit like raspberries, strawberries or whatever you’ve got available. Just be sure to make this soon, before the nice hot weather disappears again! Combine the clotted cream, milk and double cream in a medium pot and bring to the boil. While this is heating, whisk the egg yolks and sugar in a medium bowl until thickened and paler in colour. As soon as the cream boils, remove from the heat. Pour slowly into the egg mixture, whisking continuously until combined. Return to the stove, on a medium heat until combined. The test for this is if the mixture ‘coats the back of a spoon’ – that is, when you dip a spoon in, you will see the custard mixture on the back of the spoon, then run your finger through it and if the line traced by your finger remains, the custard is ready. Remove from the heat, strain through a fine mesh strainer and set aside to cool. 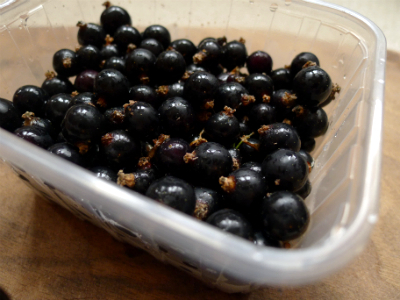 Put the blackcurrants and sugar together in a small pot and heat over medium heat for a few minutes, until the fruit releases some juices and the sugar is dissolved. You can taste it at this point and add more sugar if you like, just reheat briefly to dissolve it. Then strain the fruit mixture through a fine sieve, pressing with a wooden spoon to push all the juice through, discarding the stems and skins afterwards. Set aside until the ice cream is done. Once the custard mixture is cool, pour it into your ice cream maker until ready. If you don’t have an ice cream maker, you can put the ice cream in the freezer, removing every hour or so to whisk to add some air to the mixture, until it is has frozen. Once the ice cream is ready, pour the blackcurrant syrup on top and stir a few times to mix in but without combining completely so you can still see the swirl. this sounds divine, delicious, and then some! If you have an electric thermometer you can pasteurize your IC by boiling the dairy to 85 degrees Celsius and after tempering in eggs, bring it back to 85. That was the call in the restos, but it is was more for liability I reckon! Yum keep the IC coming!